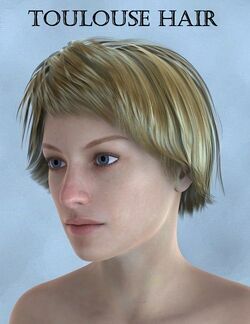 Toulouse Hair is a pixie cut hairdo for Genesis 2 Female, Genesis 3 Female, and Genesis 8 Female. The hair is available for free as part of the Genesis 2 Starter Essentials, Genesis 3 Starter Essentials and Genesis 8 Starter Essentials packages. This page was last edited on 17 November 2018, at 08:49.